Acting Police Commissioner, David Ramnarine on Friday said substantive Police Commissioner, Seelall Persaud, while on leave, allegedly instructed by telephone to release on bail the man, who allegedly plotted to assassinate President David Granger two years ago, and that the two of them are widely believed to be friends. Ramnarine also said Andre Guillard’s allegation that Nizam Khan had offered him GYD$7 million to kill the President was not properly investigated. “Taking into account all the circumstances surrounding the conduct of this investigation, my sincere answer would be ‘no’ it was not properly investigated,” he told the Commissioner of into the performance of the Guyana Police Force in investigating the alleged plot to kill the President. Asked by Attorney-at-Law, Christopher Ram if he had any information to challenge the Police Legal Adviser, Retired Justice Claudette Singh that the evidence was very weak, he said “no”. Ram cautioned Commissioner of Inquiry, Paul Slowe about ‘crossing the line’ with leading questions and that it would have been better for the Commission to have a lawyer to take evidence and leave the Commission to draw its own conclusions. Moments later before questioning Ramnarine, Senior Counsel Ian Chang added that the Commission should have had its own lawyer because he is representing the Police Force whose Assistant Commissioner and Acting Police Commissioner is Ramnarine. The Acting Top Cop said he had some doubts about the Crime Chief, Wendell Blanhum judgement to release Nizam Khan. “I have now come to learn that some time after that he may have been influenced on the very afternoon of the 29th and that is to say specifically about the call allegedly made by the Commissioner who was on leave,” he said. He added that might have “fundamentally” influenced the investigation because of the association between the Police Commissioner and Nizam Khan and Imran Khan. Ramnarine said Blanhum next communicated to him that Nizam Khan had been arrested and it was only after he (Ramnarine) had asked Blanhum in March 30 that he had been told that the suspect had been released based on his decision and instruction. “I was not consulted in relation to Nizam Khan being sent on bail,” said Ramnarine. He added that if he had a say, he would not have released the accused man. “Absolutely no. we incarcerate persons for 72 hours for far, far less serious offences or allegations,” he said. Ramnarine said he felt that Blanhum had misled him but he had never taken any action against the Crime Chief. Responding to Ram, the Acting Police Commissioner said the order to release the Khans on bail the very afternoon should have been disobeyed. “The very fact they were released the same afternoon indicates a lack of serious effort,” the police officer said. He said the probe was compromised by the Police Commissioner. “The fact that the Commissioner was on leave and his known or being seen in the company of Imran Khan, who is the brother of Nizam Khan, and a call and giving instructions- that in itself would have amounted to some sort of compromising,” he said. Ramnarine said he did not order the rearrest, but said it was a judgement call made by Crime Chief. He acknowledged that the only instance that he could mention in relation to the quality of the investigation was the release of the suspect in the initial stages. Under examination by Attorney-at-Law, Selwyn Pieters on behalf of television journalist, Travis Chase, Ramnarine said he was aware that a DVD and memorandum by the journalist had been delivered by Assistant Commissioner Sydney James but he had not viewed it but instead passed it on to the Crime Chief. “That would have been good for CID and the Head of Special Branch to review. I don’t have the equipment in my office to review it and I think at that point in time I was preparing to go to an external engagement,” he said. Questioned by Commissioner of Inquiry, Paul Slowe at the probe into the performance of the Guyana Police Force in investigating the alleged plot made by Imran’s brother, Nizam, to have Andre Guillard kill the Guyanese leader in exchange for GYD$7 million, Ramnarine said it is well-known by certain police officers, friends and acquaintances that Imran is a friend of Police Commissioner Persaud. “I don’t know the individual but some time after I learnt of the individual’s brother being Imran Khan and the fact that I recall vividly seeing Imran Khan in the Commissioner’s conference room at certain functions and one or two other places and I formed the impression that they were friends,” Ramnarine told the inquiry being presided over by Slowe, a retired Assistant Commissioner of Police. He said he had never seen Nizam Khan with the Commissioner. Under cross examination by Pieters, the Acting Police Commissioner stated categorically that “the Commissioner has been seen by me in the company or either way Khan in his company on more than one occasion” before the alleged plot surfaced. He added that in late April 2017, he had learnt that Khan and Persaud apparently had a business relationship but had never taken steps to ascertain the nature of that relationship or reporting it to anyone higher than the Commissioner. “The very nature of the role and functions and the command of the force does not necessitate it me reporting it to anyone,” he said. relationship between the Commissioner and at least one or both of the Khan brothers. Attorney-at-Law Pieters: No, but you took no steps to act on that information. Did you? Attorney-at-Law Pieters: And if the Commissioner is unethical or acting unethical, you have a duty to act? Don’t you? the persons serving under you and the public perception. Acting Police Commissioner: Suggestion noted, Sir. Persaud, who is currently on 125 days leave, is expected to testify before the one-man Commission of Inquiry. Ramnarine said it was only after he had asked Deputy Crime Chief Dass to provide the last bit of legal advice that he read that the Police Legal Adviser had asked investigators to inquire whether Commissioner Persaud had called and gave instructions, on whose phone he called, who he spoke with, and how the recipient knew that it was the Commissioner who called. The Acting Commissioner said he included that and other pieces of legal advice to the President. 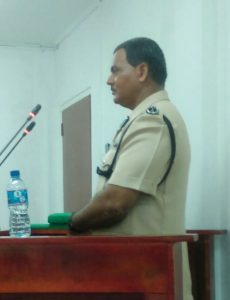 The Acting Police Commissioner said during a security meeting he had provided an update on the alleged plot and had been subjected to a number of questions and comments causing him to realise that “there was some indication of the possible involvement of senior members of the force in the early stages of the arrest” Nizam Khan and his brother Imran. Ramnarine said after he had briefed the Police Commissioner that the President had requested a report on the progress of the probe and that he had been awaiting information from the Criminal Investigations Department because of the “pretty poor” handwriting, the substantive top cop instructed him to send all the information over so that he would have prepared the report. Ramnarine said he had first learnt of the matter of March 29, 2017 when Crime Chief Blanhum called and briefed him extensively. He said he then advised that although the alleged plot had occurred since June 2015, he should spare no effort because it involved the Head of State. Ramnarine said a lot of work was needed to determine the truthfulness of the allegation and he instructed the crime chief to personally be involved. Under questioning by Attorney-at-Law Ram , representing Imran Khan, he said a delay in lodging a complaint 21 months later raises questions such as veracity, impact, and the relations between the accuser and the accused. In terms of progress, he said the detectives had arrived at an inconclusive foundation based on statements by Guillard, the accuser, and Nizam Khan, the accused. “We were getting a foundation that was inconclusive- that is to say whether Guillard was really lying or he was fabricating something or whether khan was completely innocent.” He reasoned that significant progress had not been made in the investigation because Guillard had begun mentioning names of persons who should have been contacted and the account had had a “number of twists and turns”. Ramnarine said whenever the Police Commissioner goes on leave there would be no formal handover except a call by Persaud to say that he is on leave and that he (Ramnarine) is in charge. The Acting Commissioner of Police, Ramnarine said only in a handful of instances he would have sought Police Commissioner Persaud’s advice while he had been on leave only if the latter had been personally involved in matters of the organisation, while he had been on duty about which I had knowledge but would have arisen again. The Crime Chief has already told the Commission that he was aware that Ramnarine had sought the advice of the substantive Police Commissioner even when he has been on leave.